Meet the people behind medical technology – from 18-21 November 2019 at COMPAMED in Düsseldorf. Visit the leading international market place for the medical suppliers' industry and product development! Using 3D printers to make body parts, especially bone structures, is not an entirely new approach. However, using plasma jet technology to simultaneously embed a special coating to the scaffold is certainly a new idea. The Fraunhofer IST just succeeded in implementing this process. They are everywhere: microbes. Many of them are very useful. Others can make us very sick. Especially in hospitals, old people's homes and medical practices, they can pose a danger through transmission. For example, when an immunocompromised patient comes into contact with Methicillin-resistant Staphylococcus aureus (MRSA). Special coatings on selected surfaces could help. Click here for our current Special! About 800,000 - 900,000 people every year in Germany alone suffer from nosocomial infections, i.e. infections that occur in connection with hospitalizations. About one third of these cases are caused by retrograde bacterial exposure of immuno-compromised patients. Personal drug delivery or nano-robotic systems could be a key concept for future medical applications. In this context, scientists of the Max Planck Institute for Polymer Research (MPI-P) have recently developed a technology to customize the shapes of polymers and polymeric nanoparticles using DNA. Lensless microscopy with X-rays, or coherent diffractive imaging, is a promising approach. It allows researchers to analyse complex three-dimensional structures, which frequently exist in nature, from a dynamic perspective. Whilst two-dimensional images can already be generated quickly and in an efficient manner, creating 3D images still presents a challenge. An imaging technique developed at Duke University could make it possible to peer inside cells and watch dozens of different molecules in action at once -- by labeling them with short strands of light-up DNA that blink on and off with their own unique rhythm. Joint research project "CLUSTERBATT" of the Fraunhofer Gesellschaft and the Max Planck Society deals with future energy storage technologies of batteries. The enhanced power of the new measuring technique to characterize materials at scales much smaller than any current technologies will accelerate the discovery and investigation of 2D, micro- and nanoscale materials. 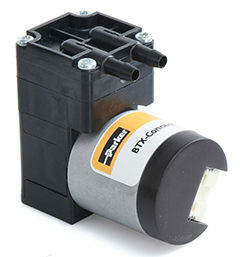 Parker’s BTX-Connect pump combines best in class pump design, innovative ‘connected’ brushless motor technology, ultra-low vibration, to your next-generation device needs. Stay informed – Subscribe to our industry newsletter here!